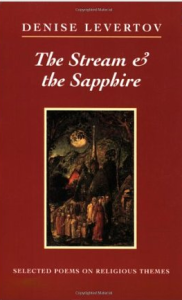 Denise Levertov: The Stream & the Sapphire. Denise Levertov wrote many poems with spiritual themes throughout her career. For example respect for nature and life, nothingness and absence, and despair with the world. There were also positive ideas and images about peace in death, wandering search, gratitude to give, wonder at mystery, and dance of delight. It is as if she had … Continue reading Denise Levertov: The Stream & the Sapphire. Posted on 23rd January 2014 Author EditorCategories Meaning of life, Poetry, Religion, The artsTags Denise Levertov, religious consciousness, The Stream and the SapphireLeave a comment on Denise Levertov: The Stream & the Sapphire.